A interesting choice is a two bucket approach. 60% initially into a 30 year inflation bond ladder to provide 2%/year SWR (drawdown) for 30 years; 40% in a equal weighted world stock 30 year accumulation/growth bucket - that historically provided a 119% gain in the worst case (which would have increased the 40 initial allocation by a factor of 2.19 to 87.6% of the original inflation adjusted start date portfolio total value). Over 30 years as 60% initial bonds drew down to zero and 40% initial stock expanded to 100% stock = average 70/30 stock/bonds (assuming no adjustment during the interim). Which is a bit like including a element of time averaging a proportion (60%) of stock over 30 years. Expanding (100% final) stock exposure might seem too excessive, but primarily that would be for younger heirs anyway for which such a stock heavy allocation might be more acceptable. If you do outlive the 30 years of bond drawdown then you become reliant upon 'inheriting' your own 100% stock portfolio, likely of reasonable value, to reallocate that as deemed appropriate to cover longevity (sell some stock to buy more bonds, or maybe just live off the dividends (rather than just reinvesting them) for your remaining years). Rather than a physical 2 bucket approach you can use the same average overall exposure as a proxy for how such a 2 bucket might have performed historically. As a (very) crude backtest of my own I used UK historic stock total return data from 1896 70% constant weighted (yearly rebalanced) combined with 30% UK Treasury Bill yields (as bonds); And applied a 2% SWR to that. For all 30 year periods since 1896 (yearly granularity) the worst case outcome after adjusting for inflation was to end the 30 years with 67% of the original inflation adjusted start date total portfolio value. The average case provided a 162% gain (2.62 real gain factor). Noteworthy however is that for the same measured over 20 year periods saw a worst case value of 41% of the inflation adjusted original portfolio value remaining after 20 years i.e. quite a significant dip. Potentially (unmeasured) such a dip likely might have been even deeper across other periods. Held through (stay the course) however and extended out to 50 years and the worst case was to have 88% of the inflation adjusted original value remaining. i.e. the dips did ultimately 'recover'. UK data is somewhat a proxy for global due to the historic nature of the UK (inheritance from Commonwealth/British Empire years). For example presently the UK's largest 100 stocks derive around 70 to 80% of earnings from foreign (global) business activities. The depth/breadth of the UK market has the likes of Australian BHP Billiton being listed in both Australia and London, amongst many others. If you look at the table I posted earlier then you see some commonality between World and UK values, but to reiterate, a very crude measure/proxy at best. Extending to make 'stocks' a equal split of US, Australia and UK broad index total returns (after a assumed constant 15% dividend withholding tax rate) and the 20 year figure improved to 78% worst case and was totally eradicated by 30 years (worst case +158% of the inflation adjusted start date amount). HOWEVER that is adding in two historic right tail (good) outcomes into the equation (data mining effect). I have not seen the Worst Case Chart before. This paper suggests that survivorship bias was relatively small (one tenth of a percent annualised (geometric)) i.e. if you account for cases where historical data wasn't available and assumed total losses in such cases (see document pages 42 and 43, PDF pages 11 and 12). I would take this kind of chart with a big grain of salt. First, there is this bias for showing stock real drawdowns, and not bond real drawdowns, which were actually WORSE, notably after WW-II. Next, fact is there is precious few historical data besides the US and the UK (and even then, it gets sketchy, cf. the S&P 90 instead of S&P 500 for many years, etc). The Triumph of the Optimists work was truly groundbreaking, and a real eye-opener in many respects, but the data per country remains very sparse and mostly unreliable in the great majority of cases. I certainly hope that research will progress towards filling the gaps, but in the mean time, a little bit of healthy skepticism is in order. Personally, the only thing I get out of this chart is to maximally diversify and certainly not bet on a single country. PS. another thing bugs me about such charts. It essentially hones on a single historical cycle, i.e. the worst case. Which is pretty much guaranteed to never happen again, since... it is a single data point. Maybe something worse will happen, mind you, or maybe not. I don't find that terribly relevant. Also, planning for the absolute worse is no way of living, plus you know, we may all end up in a nuclear winter... The 10% lowest percentile is a statistic that I find much more meaningful. Japan gave back much of its massively expanded share achieved during the 1970's/1980's over the subsequent 1990's, allowing the US to recover back to 60% levels, but the US has since seen that decline to around 50% levels. Going forward ... who knows. 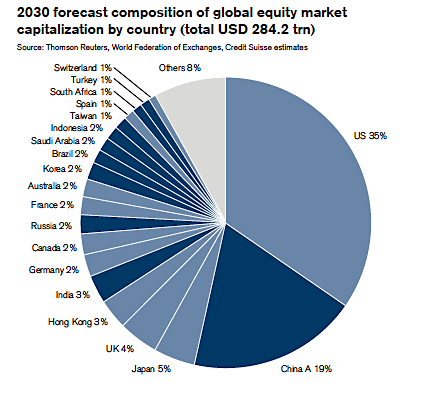 Some (Credit Suisse for instance) suggest by 2030 the US might be down to 35% levels whilst China looks to be predicted to expand its share. One thing looks reasonable, the 15 to 75 type rise (double, double again and more (five fold increase)) the US enjoyed from 1900 to the 1960's is less likely to see a repeat of anywhere near that 'right tail' expansion event starting from more recent 50 levels. The US has in effect evolved from a emerging market to a developed market. patngordo wrote: Thanks for the informative thread, and the very cool interactive simulator. I'm trying to figure out why your results are so different from Jim Otar's (Unveiling the Retirement Myth, 2009) regarding optimal asset allocation, as your models occur for me as similar. It's not online, nothing I can link to. But its in chapter 16, if you have the book, and at 4% initial withdrawal rate (example 16.2), every AA from 60% to 100% equities underperforms the 50/50 allocation, in both the bottom and middle deciles. It must be in the assumptions about returns. I was able to find a pdf. The graph is similar to mine, but you're right... failure rates are a lot higher... and argue for a 60/40 in his analysis. Not sure why this is different. His data set looks robust for the S&P and goes back to 1900. So it isn't a surprise he finds substantially higher failure rates than you do. Last edited by AlohaJoe on Thu Dec 29, 2016 1:17 am, edited 3 times in total. Clive wrote: Pre 1930's (at least from 1800) much of the world were on a gold standard (generally). Bonds during those years provided a real return such that investing in bonds was broadly 'satisfactory' and relatively safe. When I read Sidney Homer's A History of Interest Rates it seems like the 1800s are full of problems for bond holders. I mean, bonds were certainly better than stocks, so safety is relative. Homer casually mentions things like "84% of public companies went bankrupt that year"
Thanks for those historic insights AlohaJoe. The same might be said for stocks across the 20th century. For instance UK tax rates and costs were much higher in the past, nor were the tax-advantaged choices as beneficial. Some traded via post and market makers alongside brokers could make a killing (maybe 5% ... even 10%+ spreads). The Beatles sang about 'Taxman', "19 for you, 1 for me ... taxman" in the 1960's in reflection of 95% tax rates, which coincided with periods of high inflation/interest rates/dividend yields. The 'stock market' casino has much favourable attractor publicity, the realities can be markedly different. By the time you factor in costs, spreads, taxes, inflation alongside a tendency for average investors to relatively under-perform the index due to adding-high/reducing-low (fear/greed), even 0% real might have been a achievement from a historic apparent highly rewarding playfield. Look around at the high profits/rewards that the financial sectors achieve and clearly taking small amounts here and there in a largely opaque type manner pays handsome dividends. Given a bunch of assets/choices (stocks, bonds, commodities, REIT's, FX ...etc.) that individually just paced inflation after costs/taxes etc. but did so in a individually volatile manner, then the best choice would be to equal weight and periodically rebalance. Individual assets that arithmetic (simple) averaged 10% with 20% volatility (i.e. stocks) might compound to a 8% geometric (annualised) with that 20% standard deviation. Two such assets with perfect inverse correlation in contrast see the geometric = arithmetic, with a combined 0% standard deviation. For that to 'work' however both assets ideally provide the same overall average reward, if one generally outpaces the other then the volatility capture benefit might be lower than just holding the more rewarding choice alone - which seems to have a wide following that believe stocks provide such higher reward benefit. That said I have seen some who solely (predominately) invest in bonds or properties ...etc. alone and who believe they achieve comparable rewards to had they invested in stocks after all costs and taxes have been considered. Zvi Bodie likes the alternative of 10% in Traded Options/LEAPS, that he considers to be a form of 10x leveraged, combined with 90% 'safe'. Other variations of that might include selling (short) volatility, 2x leveraged stock ETF's ... etc. This example for instance held 65% in bonds but generally compared to all-stock. Concentrating more into a single asset (risk) such as stocks into retirement potentially introduces greater single asset risk, and more generally you should be looking to reduce risk not increase it during retirement years. Plain English: After adjusting for inflation, if you were to invest $5,000 in 100% Stocks and 0% Bonds, withdraw $250 each year and wait 5 years, you would have a good chance of having at least $3,429 at the end, and an even better chance of having at least $2,493 at the end. Your money could lose up to 76% of its value during a market crash during this time. At this withdrawal rate, there is also a 0% chance you will fail and have a zero balance during this period. You are saying the investor can continue withdrawing $250/year, but if the portfolio is worth $2493, the withdrawal rate is no longer 5%, it's 10%. You say he can continue doing that and still get out of the hole? How? Thanks for your comments. It is 5% of the original investment... yes.. it may become a bigger percentage of the current investment over time if the market does less well than 5% per year. Please let me know if this is not clear on the calculator and any suggestions on how you would make it clearer. Do let me know if anything still remains confusing! Another way to look at it is whilst the all-stock minimum historic SWR was around 3% or 4%, the maximum sustainable SWR was around 11% or 12%. More typical average SWR being 5% or 6%. The indications being that if the current SWR rises to being 10% of current portfolio value then going forward that is more inclined to see a outcome closer towards the maximum SWR. It isn't confusing. What I wrote is what would have happened if an investor was dumb enough to not take extreme measures. I'm guessing you used long-term returns for your calculations, but investors have to really watch for short term performance - bad sequences of returns. Retiring with 100% equity just before a bad sequence could wipe out someone's retirement. Studies by Wade Pfau have concluded that once you get through the 1st decade, it is safe to increase equity allocation, but risky before that. S&P500 nominal returns from Aug 2001 - July 2007 were 2.87% annualized. It's clear that a 100% stock portfolio would have caused an investor a lot of grief if he lost 50% of assets during this time period. I'm also aware that studies have backed your idea that high stock allocations are better, however my point is that you have to be careful about making broad recommendations such as 100% equity is the best allocation for retirees. It may be OK in some situations and some time frames to come, but there will be times when it won't be OK. For the majority of retirees, 100% equity is certainly not safe, if for no other reason than most retirees emotionally cannot tolerate the volatility and other real risks of not having enough to cover basic expenses. pkcrafter wrote: It may be OK in some situations and some time frames to come, but there will be times when it won't be OK. For the majority of retirees, 100% equity is certainly not safe, if for no other reason than most retirees emotionally cannot tolerate the volatility and other real risks of not having enough to cover basic expenses. I agree with the not being able to handle the volatility part. This is why I have (newly) placed the worse crash statistics for each asset allocation mix. As long as the investor is aware of this risk, and OK w/ it, I would suggest >=80% stocks. As for not enough to cover basic expenses... as long as these expenses are relatively constant (ie. 4% of original investment). Stocks still do fine, as you can see for yourself in the simulator. Good insurance should cover any unforseen large expense. pkcrafter wrote: Retiring with 100% equity just before a bad sequence could wipe out someone's retirement. Studies by Wade Pfau have concluded that once you get through the 1st decade, it is safe to increase equity allocation, but risky before that. This I must somewhat disagree with. Yes 100% equities would have been worst during the great depression... but ONLY in this absolute worst case scenario. I do not think a nadir like the depression will occur again due the many new features of the modern economy such as our reduced reliance on agriculture and government spending remaining constant during all other crashes. I suggest everyone interested in this topic take the time to watch the interview with Gene Fama referenced in this post. See what a Noble laureate says on the subject. Yordle wrote: Conclusions that I have made from this analysis of stock and bond data over the past 90 years is that around a 80% Stock, 20% Bond portfolio minimizes failure rates at 4% and 5% yearly withdrawal rate (constant, inflation adjusted, proportion of original investment). Furthermore, worst case scenarios (0 and 5th percentile end-of-timespan returns) are also optimized with this majority-stock portfolio. I was wondering if anyone else, on looking at this data, can come to a different conclusion? Did your data includes costs and taxes? Historically since 1913 average dividend yield 4.2%. Average tax on dividends for a high rate taxpayer 40% (with considerable volatility around that). Market makers back in postal vote days often widened spreads out to 5% or even 10%, such that over a 10 year holding period that could have added a 0.5% to 1% annualised drag factor. Add in taxes on capital gains ... and that some might have held equity exposure via funds that (like even still evident even to this day) might have levied 1.5%+ fees .... and all of mathematical real gains might have been purely for the benefit of others. If stock total net real return produced close to 0% but with considerable volatility around that would you be so keen to be heavily weight into that. Or perhaps instead hold other 0% net real alternatives that were also volatile around that, and periodically rebalance to capture the volatility effects? (A bunch of assets that achieve the same/similar broad reward, but that do so with volatility and inverse correlations yields a higher reward from rebalancing compared to buy and hold (no rebalancing)). Granted in more recent decades tax and cost efficient options are available. However in forward time that could be reversed out of, perhaps on the basis that corporates and investors aren't paying their fair share and wealth needs to be more fairly shared around. Its not only Mayfair/London where custodian vaults are full, there are waiting lists for space all around. Don't put all your eggs in one basket. The old saw and its implied consequence that otherwise, the eggs might all be broken at once, is the basic principle of risk diversification in investing. Since individual financial assets entail different risks, their prices do not move in sync. Thus, by combining them, it is possible to reduce a portfolio's overall volatility. The more imperfectly correlated securities one adds in, the closer risk tends towards its minimum level. Risk-spreading is therefore a compelling tool for investors who seek steady returns and capital protection. Safe assets, in contrast, will increase in price, even if their expected return is negative. One of the impacts of this perversion in a financial crisis is that the average loss typically exceeds the gains that an investor can chalk up when the markets are moving normally. Unfortunately this has been the rule for a number of years now. They also direct funds towards venture capital, where relatively small initial amounts can in a few instances grow into sizeable amounts. No... but "dividends" on bonds would be expected to be similar, if not higher, than stocks... so, if I were to include them, I'm not sure it would change the conclusions. Clive wrote: Historically since 1913 average dividend yield 4.2%. Average tax on dividends for a high rate taxpayer 40% (with considerable volatility around that). Market makers back in postal vote days often widened spreads out to 5% or even 10%, such that over a 10 year holding period that could have added a 0.5% to 1% annualised drag factor. Add in taxes on capital gains ... and that some might have held equity exposure via funds that (like even still evident even to this day) might have levied 1.5%+ fees .... and all of mathematical real gains might have been purely for the benefit of others. There's a grey (gray) overlap between stocks and bonds. Some bonds are more stock like than some stock. Some stocks are more bond like than some bonds. Stocks and bonds both share common risk factors ... taxation for example. More so if punitive taxation occurs over the same period as high inflation (low yields, high interest rates). Historic coincidence of such aren't purely coincidental. Diversification reduces deep risk - to risks factors such as costs, taxes, inflation, deflation, confiscation, devastation.